Picasso and Chicago, the current Regenstein Hall exhibition at The Art Institute of Chicago, is a beautiful collection of Pablo Picasso’s work. Picasso never actually came to Chicago (or the US for that matter), but his untitled work in front of the Daley Center is a vital part of the city. Picasso and Chicago is a collection mostly comprised of Picasso’s drawings and sketches, with select paintings acting as centerpieces of the individual rooms. I am a huge fan of Picasso, so seeing a more intimate side of his work is amazing. I am incredibly interested in an artist’s sketches and drawings. They push deeper into an artist, allowing for a different side to be revealed. A very interesting example of this is “Sueño y Mentira de Franco” (pictured below), a collection of etchings accompanied by a poem. Together, this piece is reminiscent of sequential art, something that is unfortunately disregarded by some as a trivial form of art. However, this piece is anything but. Its simple cover pops on its own and the panels flow erratically to form a satire on Francisco Franco, the Spanish Dictator of Picasso’s time. Among the 400 plus works of art, I was most touched by “Mother and Child” and “Fragment of Mother and Child” (pictured below). I’ve never seen these pieces together. As I walked into the section were they are housed, I was overwhelmed with a surprising sadness. “Mother and Child” depicts a young child reaching up toward its mother’s face. It a lovely scene framed in a golden hued frame. Off to the side is an unframed segment of canvas, half a man’s body filling the area. It seems he is looking over to the woman and child, his ear being seen from a profile view as the rest of his face is escapes past the edge of the canvas. It’s a disheartening juxtaposition, the mother and child being exalted and presented in a grand state, while the man is cast off and left half more than empty. According to the informational card beside the works, they were originally intended as one painting that Picasso eventually cut down to emphasize the mother and child. The arrangement in the exhibition creates a completely different interpretation than “Mother and Child” would by itself. As they stand, it’s a strange commentary on the view of men in families. Clearly I am putting my own experiences on to this painting, especially since I get this idea of melancholy and longing coming from the man when his face is nowhere in sight. Whatever the intent, it’s a powerful image that has been created. I could feel myself welling up due to both my appreciation and my heart sinking at the sight of this work. 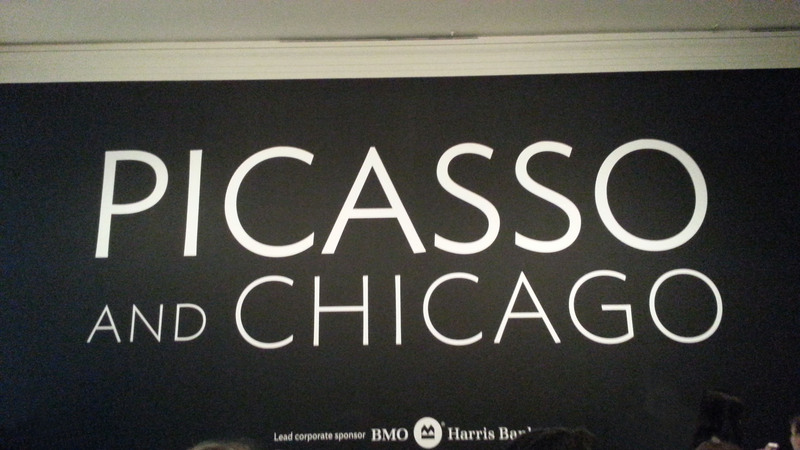 I highly recommend everyone visit The Art Institute of Chicago and take a good long look at the Picasso and Chicago exhibition, which will continue through May 12. 11 Apr	This entry was published on April 11, 2013 at 11:01 pm. It’s filed under art and design, personal and tagged art, art institute of chicago, chicago, drawings, Fragment of Mother and Child, Mother and Child, pablo picasso, picasso, picasso and chicago, sequential art, sketch, sketches, Sueño y Mentira de Franco. Bookmark the permalink. Follow any comments here with the RSS feed for this post.